Very elegant, extendable garden dining table with high graphic effect. The graphic effect of the continuous top is further highlighted with an all-black edge: a narrow horizontal line delineates space just like a graphic detail. Its legs are available in anodized aluminium or epoxy lacquer in the same colour as the top, for an even more minimalist look. It is guaranteed weatherproof. 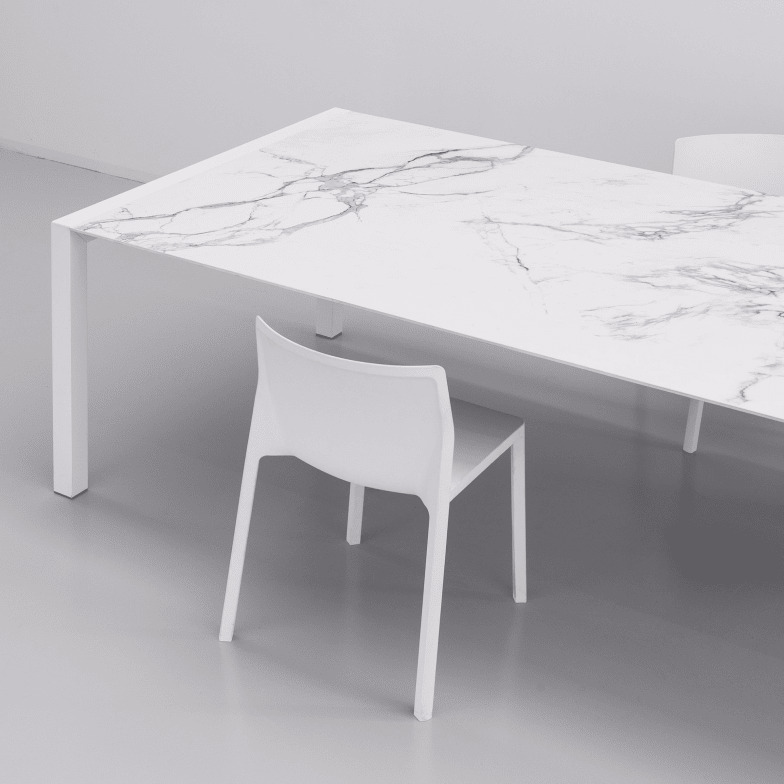 Table top and extensions are made of DEKTON® by Cosentino - a mix of the latest building materials, used to create a top that is ultra-resistant to abrasion, UV rays, temperature variations and stains. All this can be found in a thickness of just 8mm, which combines minimalist aesthetic appeal with extreme uses. The terrace and the garden are increasingly used as an extension of the interior spaces of the home, in harmony with a furnishing style and lifestyle that includes both contemporary design and the desire to be close to nature. With the extendible version of Sushi Outdoor, inviting a number of people for an outdoor lunch or dinner is no longer a problem. With just a few simple movements, it seats many with maximum simplicity and elegance. In fact, this table is available with three extensions to meet any requirement of size. Extremely simple to use, the extension system is equipped with a safety device to prevent the table from opening or closing. The extensions are extracted from a special tray in thermo-formed plastic, which is resistant to UV rays and equipped with perforations to let rainwater run off it. The extensions are perfectly aligned with the top, thanks to special elements, also in plastic. Do you have a question about "Sushi Outdoor Dekton (extendable)"? How can we contact you?